I often take life far too seriously. My mother is always reminding me to lighten up. For this I am forever grateful. I hope she never stops! May you have a wonderful weekend and don't forget to dance if you get the chance! p.s. there's that tunic with the Indian prints that you wanted to see her in... it's over here, too. what a great photo, and a great reminder. Thank you. Awww...such a sweet image. Kick up those heels! Wise words..:) the pictures is precious!! thanks for the love! hope you're all dancing through your weekend! 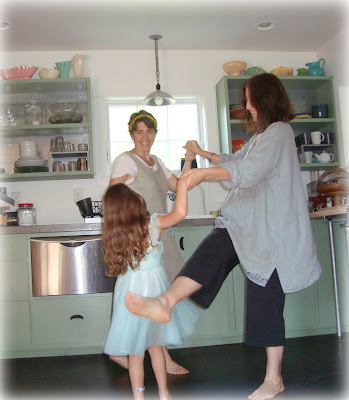 what a beautiful photo of three sweet dancing girls, lovely sentiments here!